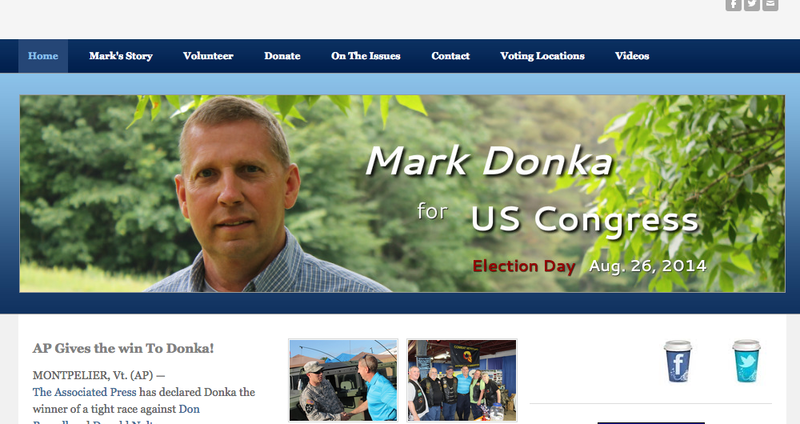 Mark Donka woke up to some good news Wednesday evening as he prepared for an overnight shift at the Woodstock Police Department: The Associated Press had declared him winner of an unusually close race for the Republican nomination to Vermont's lone congressional seat. In the hours after polls closed Tuesday night, Donka was running neck-and-neck with two other Republicans, according to partial results posted online by the secretary of state's office. But after every precinct was counted, according to the AP, Donka pulled ahead with 4,341 votes, or 36 percent. Donald Russell of Shelburne finished with 4,020 votes, or 33 percent, and Donald Nolte of Derby had 3,802, or 31 percent. The photo finish, Donka says, "kind of shocked us." Having won the GOP nomination two years before, the Hartford resident thought he had it in the bag. "Now it's time to roll up our sleeves and really get to work," he says. Indeed. Donka faces a formidable opponent in incumbent Democrat Peter Welch, who has not faced a serious challenge since he won the open seat in 2006. In addition to high name recognition and support from Vermont's business community, Welch boasts a serious campaign cash advantage. Donka has a unique proposal to make up for Welch's cash advantage. "I figure he should split it with me to make it even," the challenger says. "I know he's all upset about Citizens United. I know he doesn't want to see money in politics. So I'd think he'd want to give me a fair race." But, he adds, "I'm not going to hold my breath." In 2012, Donka lost to Welch 23 to 72 percent. He says the difference between this year's campaign and his first outing is like "night and day." "We have a pretty good team put together, compared to last time," he says. "I was totally green last time around and learned a lot that election cycle." Donka plans to campaign vigorously, when he's not busy working, and hopes to face Welch in more debates than last time around. "The biggest thing is just getting out and letting people know there's a choice," he says. To Donka, the choice is clear. Unlike Welch, he says, he believes in balancing the budget, reducing the national debt, reforming the tax system and repealing the Affordable Care Act, better known as "Obamacare." "Young people can't afford the Affordable Care Act," he says. "That's ironic, isn't it?" Other than fundraising, Welch’s campaign has, thus far, appeared low-key. His compliance director, Meredith Woodside, says the Norwich Dem has no plans at present for a formal campaign kickoff. Welch does appear to have a campaign team in place. Woodside and another political aide, Coleman Young, are working full-time for his reelection effort, while former campaign manager Jon Copans is “transitioning” to the team from Welch’s congressional office, Woodside says.